Join us on Wednesday, August 2, 2017 for a night of laughter and fun at Governor's Comedy Club in Levittown, New York. Plan a Date Night, a Girl's Night Out, or a special celebration. 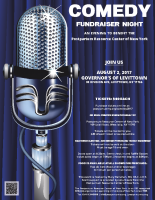 Come on your own, with a friend or even a group....but no matter how you arrive, know that you will not only enjoy a night of comedy but also help New York State moms, dads, and families in need. Tickets are $40.00 each and seating is limited. You can purchase tickets securely now by using the form below. Tickets will held for you at the door. Please note well that tickets will NOT be sold at the door. All proceeds to benefit the essential programs and services of the Postpartum Resource Center of New York. Thank you in advance for your support and we look forward to seeing you there! Seating is limited. Tickets will NOT be sold at the door. Food is available at all shows for purchase. ** 2 item (food and/or beverage) minimum per person at table. ** Tickets will be held for you at the door. ** Tickets will NOT be sold at the door. The flyer for this event is below (pdf). Please feel free to download and post wherever it is allowed. Please share this page / event on social media. Invite friends through our Facebook event page, which you can reach here. To purchase a ticket(s) and/or a sponsorship, please complete the secure form below and submit. Double Page Ad (size 5 x 8) in the Event Program and name recognition in the Scroll of Honor I Sponsorship displayed on Sponsorship Thank You Board at event I Link from PRC of NY website to company’s site For 12 months. Includes four (4) tickets for event. Full page Ad (size 5 x 8) in the Event Program and name recognition in the Scroll of Honor I Sponsorship displayed on Sponsorship Thank You Board at event I Link from PRC of NY website to company’s site For 12 months. Includes two (2) tickets for event. 1/2 page Ad in the Event Program and name recognition in the Scroll of Honor with link from PRC of NY website to company’s site for 12 months. Business Card Ad in the Event Program and name recognition in the Scroll of Honor. PURCHASE TICKET(S) AND/OR SPONSORSHIPS BELOW. Please select the number of tickets you are purchasing from the drop-down menu. If you are not purchasing a ticket, leave the field as "Not Purchasing a Ticket." Please select a sponsorship from the drop-down menu. If you are not interested in a sponsorship, please leave the field as "Not Applicable." Please add any information to your ticket and/or sponsorship order here.